Lagomorphs (the classified order into which rabbits fall) are small to medium mammals with soft fur. The soles of their feet are well furred which helps dampen the shock of rapid hopping. The have long toes that are webbed which keeps them from spreading apart as they jump. When there is a tail, the tail is very short. Their distinctive characteristic is having six (6) incisors. They have two upper sets and one lower set. The first pair of upper incisors are large and each tooth has a long groove on its front surface. The other pair of upper incisors are directly behind the first pair and are small and peg shaped. The incisors are a white enamel color. (Rodents have one pair of incisors and are yellow in color.) Both lagomorphs and rodents have teeth that have no anatomical root which means they continue to grow throughout life. Lagomorphs also have premolars and molars. 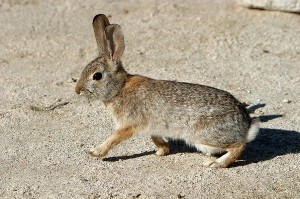 All lagomorphs are herbivores and they move about by hopping. They do not hibernate in winter. Doheny has two types of rabbits; Bush Rabbits and Audubon Cottontails. They look very much alike, so good luck in telling the difference. Photo above is of a Bush Rabbit. 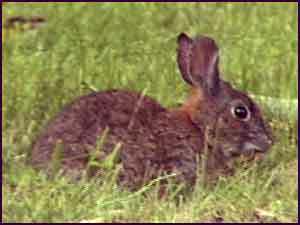 Below is an Audubon Cottontail.